» Top 4 Best Short Scale Bass Guitars: Is Playing Short Scale Guitar Right for You? Top 4 Best Short Scale Bass Guitars: Is Playing Short Scale Guitar Right for You? A short scale guitar can be any guitar: bass guitars, acoustic guitars, scale electric guitar- you name it, and there is probably a short scale version of the guitar on the market. These types of bass guitars are more compact than your average bass guitar and make an excellent choice if you’re looking to purchase a short scale bass if you’re shopping around for young guitar players. Short scale bass guitars are also great instruments for people will smaller statures to play on, especially if you are someone who has smaller arms or smaller hands. Many bass guitar players find that the compact spacing on the bass guitars makes the instrument much more comfortable to play. Short scales are also easier to tune because of the shorter bass guitar strings on the instrument, as shorter strings don’t require as much tension to maintain a proper tuning. That’s also part of the reason why short scale basses make great instruments for younger children. Spending a long time tuning a stringed instrument can be boring, so if you happen to have a child that isn’t exactly super patient, having a short scale bass guitar that’s easy to tune can help to limit your child’s frustration levels when learning how to play a new instrument. 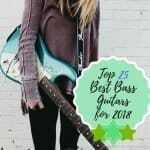 Top Four Best Short Scale Bass Guitars- Is Playing Short Scale Guitar Right for You? When someone is talking about the scale length on stringed instruments, they are talking about the distance between the bridge pickup and the nut on the guitar. The scale length does not represent the length of the neck of the guitar! Generally, the average bass guitar will have a 34-inch scale length, while short scale bass guitars will have a 31-inch scale length. Physically comparing short scale bass guitars to long scale bass guitars, you will see that short scale bass guitars have shorter necks, a smaller amount of distance between frets, and are generally more compact than long scale bass guitar. When you’re physically handling a short scale bass guitar, these types of guitars have a very different feel to them in comparison to long scale bass guitar. This difference in feeling is noticeable if you’re used to handling long scale bass guitars, but will feel completely normal in your hands if you’ve never touched a long scale bass. Short scale bass guitars have unique tonal characteristics when compared to long scale bass guitar. When you play a note on a bass guitar, that individual note comes with a series of harmonics that provide each instrument with a unique sound. As the length of the strings changes, the volume and the sound of the harmonics will change. The shorter the length of the string becomes, the higher harmonics will have a smaller amount of volume. If you happen to tune a short scale bass guitar with a pair of normal bass strings, the strings will have a lower tension than if you were to place the same strings on a regular bass guitar. Using a pair of normal bass strings on a short scale bass will provide you with a looser feeling to the strings, which will also have an effect on the dynamical range of the instrument, as well as the attack and sustain of the guitar. However, finding short scale bass guitar strings that will fit your short scale bass won’t be too difficult! Do long scale bass guitars and short scale bass guitars sound different? For a short answer: yes, long scale bass guitars and short scale bass guitars do sound different. If you’re looking for a longer answer: short scale bass guitars will sometimes use a heavier string gauge than long scale bass guitar, which provides the short scale bass guitars with a thicker, more robust tone that many guitarists might be looking for. This also means that short scale guitars require a low string tension to maintain a proper intonation, which will provide the guitar strings with a loose feel to the strings. Having a lower string tension will provide the instrument with a larger sounding low register. Fun fact! Did you know that famous bass players such as Paul McCartney, Bill Wyman, Glenn Cornick, Tin Weymouth, and Trevor Bolder often used short scale bass guitars? The Squier by Fender Vintage Modified Jaguar Bass Guitar (try saying that five times fast) is a great choice if you’re looking for an entry-level bass guitar, but would make a great addition to the collection of any experienced bass guitarist. If you happen to be one of the bass players or guitarists that’s on the hunt for a bass guitar that’s going to provide you with a warm tone, with a softer low end combined with muted highs, you’re going to want to get your hands on this short scale bass guitar. Now, finding the best short scale base guitar that’s comfortable to play can be a difficult task, as there are a lot of short scale bass guitars out there that are just cheap bass guitars and aren’t very comfy to play. However, the Fender Squier Vintage Modified Jaguar Special Short Scale Bass guitar is very easy to handle, as it has a perfectly shaped maple neck that is covered with a rosewood fretboard. On Amazon, the Squier by Fender Vintage Modified Jaguar Bass Guitar is $200. Check out the latest price! This is a 30-inch short scale bass guitar, just in case you were wondering! The neck radius is 9.5-inches, which makes it great for hands of all sizes. The inlays on the fingerboard of this short scale are dotted. This short scale does have 20 frets instead of 22. This doesn’t affect the sound of this instrument at all, but it does limit the range of the instrument by two frets. The biggest downside that comes along with the purchase of this bass guitar is that its kind of difficult to keep the tone of your instrument under lock and key, even as an experienced musician. I found that this was especially a problem with the lower end of the bass guitar, so if you’re someone who depends heavily on the low end of a bass guitar to play your music and you hate having to constantly re-tune your instrument, you may want to consider switching to a different short scale. Single-Coil Pickups? As for the pickups that are installed on this short scale bass guitar, you’re going to getting your hands on a single coil jazz bass pickup and a split coil P-bass pickup. To customize your sound, you will have access to the standard dual volume knobs and a master tone control knob. Sometimes, the tone can be too loose sounding. At the end of the day, the Fender Squier Modified Jaguar Short Scale Bass Guitar is still an incredible short scale bass guitar in part to the versatility that this instrument has to offer, but also because of the quality workmanship that went into crafting this beautiful short scale bass guitar. The EpiphoneEB-0 Electric Bass Guitar has an extremely similar cosmetic appearance to the Gibson SG electric bass guitar. The SG was one of Gibson’s most famous guitars and still holds a great amount of respect from bass musicians all around the world. While the EpiphoneEB-0 Electric Bass Guitar may not describe itself as a short scale bass guitar, the scale length of this instrument is 30.5-inches. This short scale bass guitar only has 20 frets, which means that if you’re really looking to experiment with higher sounds, you’re not going to be able to play around too much. This short scale bass guitar is cut out of solid mahogany and is paired with a bolted mahogany neck (bolt-on neck) and a rosewood fretboard with dotted inlay. The neck on this bass guitar is extremely fast and smooth feeling to play on! Your sound will be produced from a single humbucker pickup, and you will be able to customize your sound through one master volume knob and one master tone control knob. If you’re a beginner looking to get your hands on a model that’s extremely similar in sound and feel to the Gibson SG for a cheaper price tag, the EpiphoneEB-0 Electric Bass Guitar isn’t a bad choice at all! I would also highly recommend the Epiphone EB-0 electric bass if you’re looking to play around with a pedalboard or any distortion effect, as this instrument only comes with one pickup. You can find the EpiphoneEB-0 Electric Bass Guitar on Amazon for $270. Check out the latest price! Budget-friendly alternative to the Gibson SG. 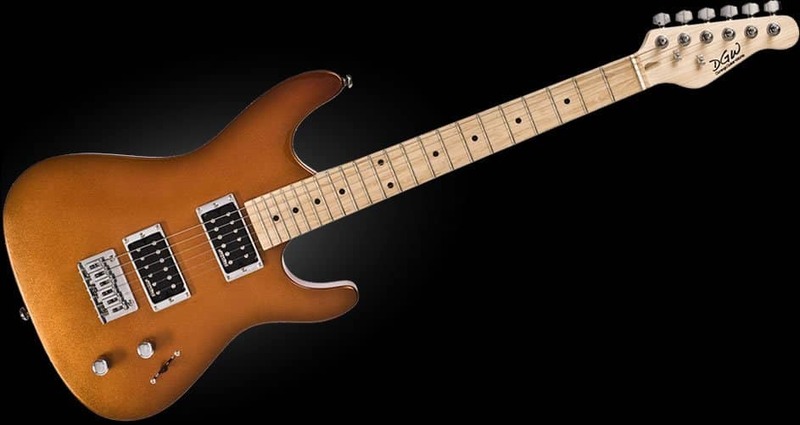 Comes with a humbucker pickup. Since there isn’t another pickup on this bass guitar, you aren’t really going to be able to experiment too much with your sound. The Gretsch G2224 Junior Jet Electric Bass Guitar II is another short scale bass guitar that’s extremely popular in the guitar community and for a good reason. If you are someone who has been involved in the guitar community for a while, you may have heard of the brand Gretsch. However, if you’re new to the world of guitars, you should probably know that Gretsch is a guitar manufacturer that’s extremely popular and well-known for producing guitars of the highest quality regarding durability and sound. If you’re on the hunt for the best short scale base guitar neck that’s easy to make transitions on, the neck on this short scale bass is at 30-inches, which makes it perfect for quick transitions. The volume and tone control on this guitar will provide your instrument with nearly flawless sound. 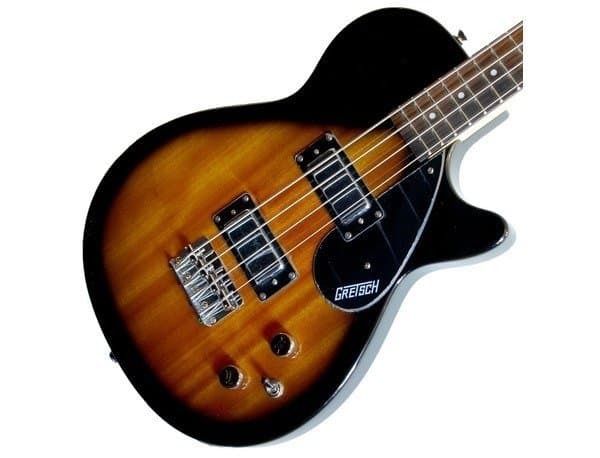 On Amazon, the Gretsch G2224 Junior Jet Electric Bass Guitar II is $300. Check out the latest price! Affordable, considering the brand that this guitar is manufactured by. Excellent quality sound, especially if you’re looking for a deep bass sound. Pleasant feel, very comfortable to hold. Some of the models produced have loose controls, but this can be easily fixed by adjusting the screws on the back. Minor fret buzzing when you’re first learning how to play, but this is easy to overcome once you have better control of the guitar. The Ibanez GSRM20 Mikro ¾ size bass guitar is said to be one of the best entry-level short scale bass guitars to beginners to choose from and I have to say- I disagree. The Ibanez GSRM20 Mikro ¾ Size Bass Guitar is not only a great entry-level short scale bass guitar for beginners to choose from, but as an experienced guitar player, I swear by the GSRM20 Mikro for performances. 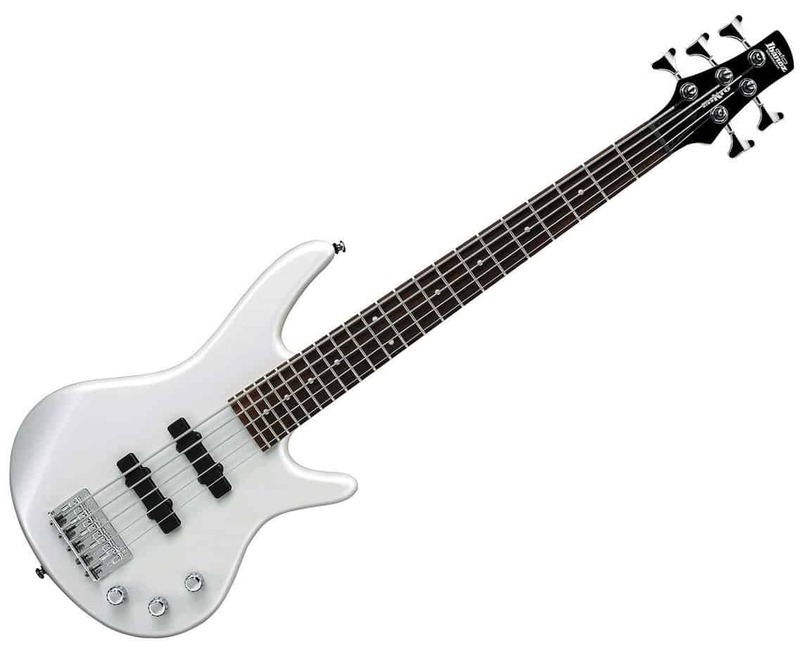 You can find the Ibanez GSRM20 Mikro ¾ Size Bass Guitar [/easyazon_link for $160. [easyazon_link identifier="B001R2MJ2W" locale="US" tag="guitarspace-20"] Check out the latest price! I love playing on this short scale bass guitar because I absolutely love the sound that this instrument produces; this short scale produces an incredibly full sound that’s not only versatile, but a lot of fun to listen to. The thing that I disliked most about this guitar is the pickups that come installed with this short scale. Thankfully, the pickups installed on the GSRM20, J-style and P-style pickups, don’t damage the sound of the instrument. The sound that the short scale produces is still incredibly substantial and if you adjust the tone and the volume controls properly, you will be able to get a decent variation in your sound. However, my dislike for the pickups on this instrument is just me being extremely picky in the taste I have for my sound. Besides my personal dislike for the pickups on this short scale bass guitar, the rest of this short scale bass guitar is a dream. Aesthetically, the visual appearance of this guitar is absolutely amazing. The physical feel of this instrument leaves you with no sharp ends and no fret sprouts, which means you aren’t going to worry about accidentally cutting your hand while you’re playing. Comes installed with your average pickups, which isn’t too exciting. Final Note: So What Should Base Players Choose? Pros - Offers several different features, which makes the learning possibilities on this short scale nearly endless. - Comes with two pickups plus knobs, which will allow you to customize your sound truly. The humbucker pickup on this short scale bass guitar is what sets it apart from the other high-quality short scales on this list. The humbucker picks up a lot more signals than other pickups on this list. Comfortable to play on, especially if you’re not used to playing on heavy guitars. Also provides users with a deep bass sound that sounds more like a long scale bass guitar than it does a short scale bass. - Even though this is a short scale bass guitar, you’re still going to be able to get your hands on 22 frets. - With more frets you’re going to be able to better develop your technique and sound. Cons The tone can be very loose sounding, especially if you’re used to play full scale bass guitars. Only comes with a humbucker pickup, so you’re not going to be able to experiment too much with a unique or different sound. When you’re first learning how to play, you will probably experience minor fret buzzing until you get used to play on the guitar. Doesn’t come with any sort of unique pickup to make a different sound than its competition. At the end of the day, you have to figure out what short scale bass guitar is best for you by deciding what your personal needs are. What works for your bass guitar buddy may not be the best short scale bass guitar for you.Finding a high-quality short scale bass guitar on today’s market can be very difficult, as a lot of the short scale bass guitars that are available are produced with poor quality materials. Using cheap materials to build an instrument is going to result in sub-par sound and an instrument that isn’t going to be able to withstand any wear and tear. 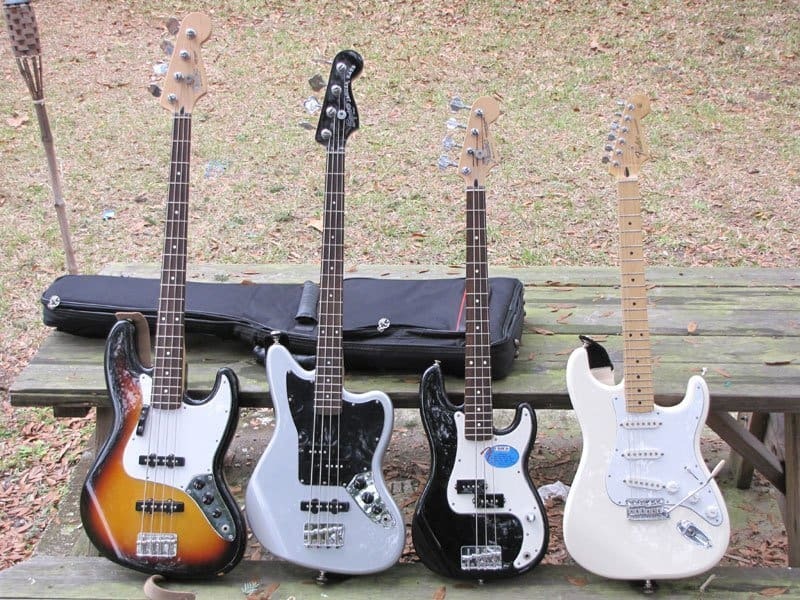 As I always say, before you make any final purchases, do your best to go in the store and test out some short sale bass guitars to see which one you like the best. Have fun finding your new short scale bass guitar! Looking for a Full Bass? Check out these top bass guitars for this year. Best Beginner Bass Songs: Get started with the optimal songs to master the craft in the shortest period of time. The Ultimate Mooer GE100 Reivew: Is this Pedal Worth it?